McRaven also wrote that Trump “humiliated us on the world stage.” This op-ed is six paragraphs of intense, focused rage from one of the last men to see the author of 9/11 alive. As someone who covers politics for a living, I know that this is the moment that we all normally go “lol nothing matters,” and I hear you. In fact, “lol nothing matters” is the correct political analysis most of the time, but hear me out on this. It’s easy to be cynical these days. The Republican Party operates like a cult (so says Republican congressman Bob Corker) and it’s seemingly impossible to find any momentum to stem the tide of Trumpism outside the democratic process. That’s why so much hope (wrongly) has been placed on Robert Mueller’s Russia investigation. He will not save us. Impeachment is a political question, not a legal one, and we know the answer to that question so long as Republicans control the Senate (where the vote to remove the president takes place—that’s why Bill Clinton remained president after only getting impeached in the House). Trump could eat a live child with a fork and knife on the White House lawn and it still would come down to congress’ decision whether he can keep his job, and we all know by now that the GOP would pretend that they never saw it happen. All Republican congressmen are the literal definition of cowards. However, Lawfare’s executive editor, Susan Hennessey, has plenty of experience with the admiral William McRaven’s of the world, and she raises an important point about this salvo fired at the presidency. I think people saying the McRaven op-ed won't matter are missing the intended audience, which is not the general public but a small community of peers grappling with the right path in the present moment. His choice to say this now will matter to them. And courage is contagious. Greg Miller, national security reporter for The Washington Post—who also operates in these circles—agreed with Hennessey, and he effectively called out some present high-ranking intelligence officials. I do not traffic in these intelligence circles, nor have access to the most secretive information on the planet, so my guess as to people like Director of National Intelligence, Dan Coats' power in this situation is as good as yours, but suffice it to say that those who do control the most sensitive information on the planet can create quite a bit of leverage over the president to which they are legally bound—if they want to. But that's not the only area where this op-ed could have an impact. Trump disparaged John McCain's heroism of choosing to remain in captivity in solidarity with his countrymen at the torturous Hanoi Hilton during the Vietnam War. For all the talk of respecting the flag and the troops on the right, that all goes out the window the moment Trump expresses an opinion. What he says, goes. The fever will not break, and all we can really do right now is build a movement to remove Trump from power one day. But when it comes to those working in government—congress specifically—there is hope that an extraordinary op-ed like this could reverberate into something tangibly positive. I know this is easy to forget given their perpetual inaction (to do anything good for most of us), but congress has an immense amount of power to check the presidency. That's why it exists. Changing the members in congress is the best way to ensure that power over Trump actually gets exercised (so vote, damnit), but if Hennessey's contagious courage thesis is true, more high-level former military (and especially current military) members publicly speaking up would put pressure on congress. In an ideal world, these military folks speaking out would spread outside the bounds of the armed forces. I wouldn't hold my breath on this happening given what I've learned about American capitalism, but if the contagious courage thesis extends beyond the ranks of former military members, watch out. For example, pretty much every single Republican will tell you (off the record) that Trump's trade war is an astoundingly horrible idea that can only hurt their prospects of retaining congress. But, because Bob Corker is correct in saying the GOP functions like a cult, no one will really stand up to Dear Leader to do anything about it. Sure, the Ben Sasse's and Jeff Flake's of the world will make noise on Twitter and give speeches about how they're gravely concerned—but either of them could literally control the one-vote chamber that is the Senate (with McCain presently sidelined by illness) if they threatened to vote with the Democrats until the trade war stopped. But they won't do it under our present conditions. Now, if say, the CEO of Boeing took inspiration from McRaven and moved as many of their operations as possible outside the United States, and threatened to continue to do so until Trump ended this trade war madness, you would see A LOT more pressure coming from congress on this topic. Again, it just requires one vote to completely shift the power in the Senate. As long as John McCain is not present to cast his vote, it's 50 Republicans versus 49 Democrats. One dissenter would flip that dynamic. 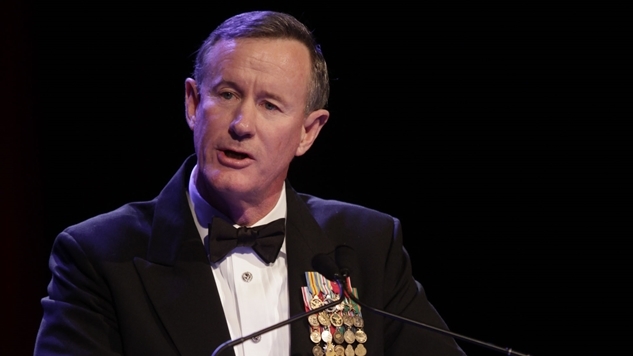 All it takes is a little courage resembling what admiral McRaven displayed above. But like I said earlier, outside of the bounds of former or current military: don't bet on it happening. Inside the bounds of the military? Let's abandon our cynicism for a bit and earnestly see what happens. This op-ed is a big deal. UPDATE: I wrote all the above yesterday after the op-ed was published, and when I woke up this morning, an avalanche of former security officials spoke out against Trump. There is exceptionally more pressure on current intelligence officials to do so now.